China has for the first time admitted in public that it permits trade in skins from captive tigers, according to participants and officials at a meeting of an international convention to protect endangered species. They said the Chinese authorities had never before reported this to the Convention on International Trade in Endangered Species of Wild Fauna and Flora (Cites). However, during the convention's standing committee meeting in Geneva, China reportedly said that it still banned tiger bones. "A Chinese delegate said, 'we don't ban trade in tiger skins but we do ban trade in tiger bones,'" a participant in the meeting said. Cites secretariat sources confirmed that a member of the Chinese delegation had said this. Chinese Foreign Ministry spokesman Qin Gang told the BBC Chinese Service he could not verify the reported admission, but he said that China will "investigate and combat" any illegal trade in tiger skins. Between 5,000 and 6,000 tigers are believed to be in captivity in China. Wildlife conservation organisations have long demanded an end to the trade in skins. Wildlife experts believe "tiger farming" in China has fuelled demand for the poaching and trafficking of the endangered species elsewhere. They say the admission at the meeting will increase pressure on China to curb the practice. Reports also say that the facilities where the captive tigers are held have been providing live animals and parts for illegal international trade. According to officials and participants at the Cites meeting, the admission from China followed the presentation of a report which gave details of how the Chinese government had allowed commercial trade in skins from captive tigers. "The report presented in the meeting created a situation that required China to respond," said a participant who did not wish to be named. "Basically when the meeting focused on the findings of this report, the Chinese delegate intervened," he said. "It was the first time they admitted officially that this trade exists in China." Participants say this created quite a sensation during the Cites meeting. "After the Chinese intervention... we too intervened and made it clear that the investigations we have done with other organisations clearly show that the trade in China is happening on a commercial scale," said Shruti Suresh, a wildlife campaigner with the UK-based Environment Investigation Agency, which has investigated the illegal wildlife trade across the globe. "The clarification was necessary because the Chinese delegate did not say that it was happening on a commercial scale, and there was a risk that the trade could later be misreported as something done for scientific research or, say, displays in the museums." Member countries of the Cites are required to report on what progress they have made to ensure that trade in specimens of wild animals and plants does not threaten their survival. A new report on illegal wildlife trade suggests that around 1,600 tigers, both from captivity and the wild, have been traded globally since 2000. While China has been a major market for tiger parts, wildlife experts say other South East Asian countries like Vietnam, Thailand, Lao, Cambodia, Malaysia and Indonesia are also emerging as consumers, where tiger farming is growing. Reports say that in the past two years, there have been seizures of nearly 90 tigers likely to have been sourced from, or trafficked through, captive facilities across South East Asia and China. "Demand-reduction efforts and enforcement and anti-trafficking activities are undermined both by the existence of facilities that keep and breed tigers for commercial purposes, and the lack of enforcement to stop trade from or through them," says a report by Species Survival Network (SSN), whose members include more than 100 wildlife conservation organisations. "Trade in these specimens perpetuated the desirability of tiger parts and China's experiment in licensing the domestic trade in skins of captive tigers has done nothing to alleviate pressure on wild tigers, as evidenced through continued poaching in the wild." A little more than 3,000 tigers are believed to be left in the wild across the globe. 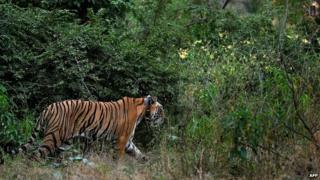 More than half of those are in India, where 42 tigers were killed last year. "If the Chinese government has admitted the trade in tiger skins, I think it is a forward step toward curbing illegal trade in tiger parts," said SP Yadav, deputy inspector general of India's National Tiger Conservation Authority. "Denial mode does not help solve the problem but once you accept what is happening, it's easy to move ahead." The SSN report says the skins of tigers, leopards and snow leopards are valued among the political, military and business elite as luxury home decorations in China. "The outcome of recent corruption cases in China confirm they are 'gifted' as non-financial bribes to officials," the report says. In 2005, China had announced that it was considering re-opening the domestic trade in tiger bone from tiger breeding facilities. Two years later, Cites parties adopted a decision calling for the phasing out of such facilities. Could Africa save China's tigers?